Very rarely can you excavate a historical site of a standing, or formerly standing structure and not come away with nails or nail fragments. Just to be clear, these fragments rarely look like the perfectly polished nails on display in museums. 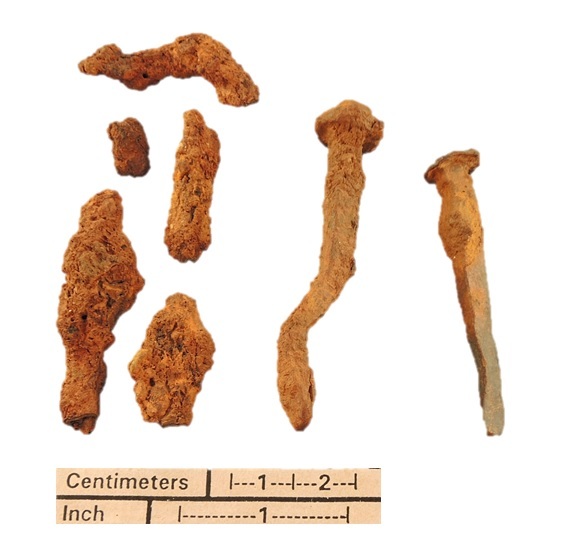 Some field archaeologists have taken to calling highly oxidized nails from an excavation site “Cheetos®” due to their being incrusted with rust; this oxidation morphs previously sharp and angled pieces of metal into cragged and rough blobs. Despite their seemingly simple function, there is a surprisingly wide variety of nails that can be found at a site. In general, for construction purposes, there are three different types of nails that can be found at a historical site: wrought, machine-cut, or wire. Wire nails which are used today, came about in the late 19th century. While other nails types, including less expensive machine-cut nails which were formed from sheet iron, were invented towards the end of the 18th century. Hand wrought nails, which date back to before the early 1800s, were often preferred due to their durability and variety of uses (Nelson 1968). Prior to the invention of machine cut nails, hand wrought nails were the only type available to the colonists (Hume 1969). They were made by blacksmiths, the various heads hammered onto square iron “nail rods,” and the type of head depended on the intended use of the nail. One of the more common nails found is a “rose head”, the nail having been struck four to five times to create a faceted appearance on the head of the nail (Carson and Lounsbury 2013). Additional wrought nail heads usually took on the shape of either an ‘L’ or a ‘T’ but others were developed with more specific uses. Nevertheless, rose head nails were primarily favored in the ongoing construction in the colonies. In addition to the heads, the tips also varied based on their intended use. 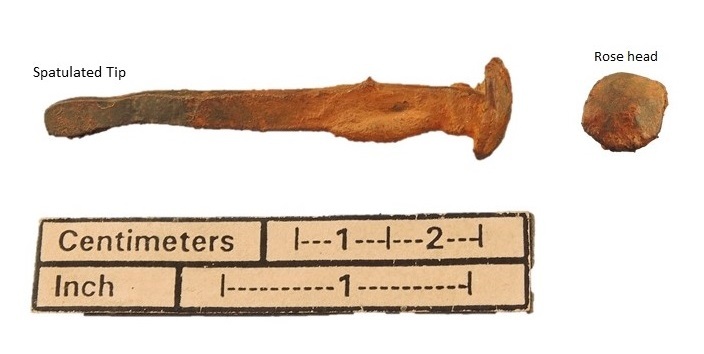 While we are most familiar with a pointed tip, spatulated tips, which were usually struck with a hammer once to flatten the metal at the tip were less likely to split the wood they were being driven through (Carson and Lounsbury 2013). See also Archaeological Data: How Can Artifacts “Say” Anything about the Past? Carson, Cary, Lounsbury, Carl R. (editors). 2013 The Chesapeake House: Architectural Investigation by Colonial Williamsburg. The University of North Carolina Press, North Carolina. Hume, Ivor Noël. 1969 A Guide to Artifacts of Colonial America. Alfred A. Knopf, Inc., New York. Nelson, Lee. 1968 Nail Chronology as an aid to dating old buildings. American Association for State and Local History, Tennessee. This entry was posted in Archaeology, Artifacts and tagged Colonial fastener, fasteners, handmade nails. Bookmark the permalink.